As part of our Bald Girls community, you know first hand the impacts of alopecia areata. That’s also what the FDA wants to learn. They held an AA patient-focused meeting in September 2017 attended by Bald Girls Do Lunch CEO, Thea Chassin. Friends like you rallied with personal experiences for our impactful submission. Thank you, again, to all who answered and shared their stories. 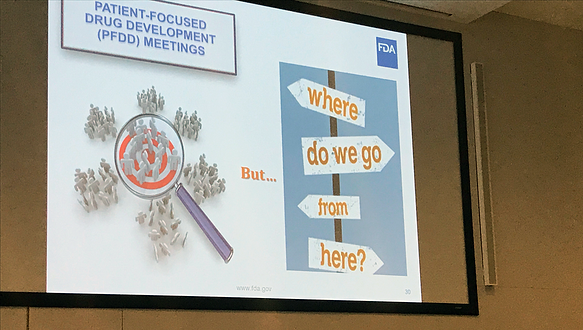 The FDA asked these questions for the “Public Meeting of Patient-Focused Drug Development for Alopecia Areata”. Today, we're keeping the conversation going! Which symptoms have the most significant impact on your life? Are there activities that you cannot do at all or as fully as you would like? How do symptoms affect your best day? worst day? Has your condition changed over time? What worries you most about your condition? About your Appearance? What are you currently doing to treat your condition or symptoms? How well does your current treatment control your condition? What are the most significant downsides to your current treatment? What specific things would you look for in an ideal treatment? What factors do you take into account when selecting a treatment? Join the conversation! Add your comments below.